With each new album, guitarist, singer, and songwriter "Steady Rollin'" Bob Margolin continues to expand the boundaries of modern blues. 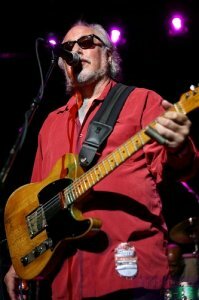 Margolin, a sideman for Muddy Waters from 1973 to 1980, was born on May 9, 1949, and raised in Brookline, MA, became enamored with the recordings of Chuck Berry while still in high school and began playing out a few years later while attending Boston University in the early '70s. Working with a variety of Boston-area blues bands and one he called the Boston Blues Band, he elected to pursue music full-time. In 1973, he joined Waters on the road and in the studio for seven years, playing festivals and clubs around the U.S., Canada, and Europe with the legendary bluesman, who died in 1983. Highlights of his career with Waters' band included the taping for The Last Waltz on Thanksgiving Day 1976, and performing at the White House for Jimmy Carter in August 1978. In 1980, two years after getting his nickname from a Boston DJ, Margolin began leading a band under his own name and did so for nine years before recording his first album for Tom Principato's Powerhouse label. He later recorded a second album for Powerhouse, but both are now out of print. He continued touring before getting his second big break in 1993, signing up with Bruce Iglauer's Alligator label, which by then had grown by leaps and bounds and had secured stable worldwide distribution. Margolin's albums for Alligator are superb recordings that advance the traditional boundaries of the music: Down in the Alley (1993), My Blues & My Guitar (1995), and Up & In (1997). Each one is a delightful mix of familiar blues covers and Margolin's idiosyncratic, insight-filled, and sometimes funny original songs. Hold Me to It followed in 1999. In 2003 Margolin released All-Star Blues Jam, his first disc on Telarc Blues, which featured former members of Muddy Waters' band: Pinetop Perkins, Carey Bell, and Willie "Big Eyes" Smith. The mostly one-man-band effort In North Carolina appeared from Steady Rollin' in 2007.